My Principal recently became a grandfather, so to celebrate he bought every teacher in the school a package of rice cakes and a bottle of banana milk. In Korea, rice cake is used in a similar capacity whenever anyone experiences a sudden stroke of luck or joy in their life. If someone gets engaged, we get rice cake. When someone has a baby, we have rice cake. When a student gets into college, their parents make sure we get full on rice cake. Usually it's more than I can really stomach - I mean they give us BRICKS of rice cake. Since I've been here I have probably thrown out a kg of rice cake after getting home from school. I mean, I can't share it with the other teachers - they have their own gigantic lump of rice cake to swallow. I remember learning several years ago about how when a Japanese golfer hits a hole-in-one, he or she is expected to throw a party and buy food, alcohol, and gifts for pretty much all of their friends and everyone else on the golf course that day. They actually buy hole-in-one insurance to protect themselves against such an unlucky event. In Korea I haven't heard of anything quite so drastic, but they do have traditions in a similar vein. When you experience good fortune in Korea, you are generally expected to share your happiness with others in the form of gifts (often rice cake). On your birthday, you are expected to buy all of your friends dinner - not the other way around, as most English teachers here are accustomed to doing. When you get engaged, married, have kids, and your kids do well enough to get recognized for something, you show your appreciation for those around you. Granted, their friends and family will also buy them gifts or give them money to celebrate certain occasions, but the onus generally seems to be on the one celebrating to do the sharing. 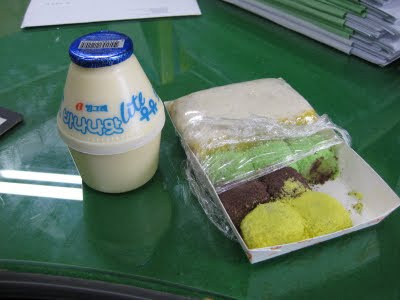 As it turns out, either I'm getting more Korean or the rice cake the Principal delivered today is starting to taste a lot better. I'll probably eat the whole package by the end of the day. Interesting - hopefully the mini-keg of banana milk helps to wash down the rice cakes. It is the mother of all candies. i haven't yet. it looks pretty amazing.